Bioidentical progesterone cream reduces the symptoms and discomfort of Estrogen Dominance without the side effects associated with many of the commonly recommended synthetic hormones and pharmaceuticals. It has been discovered that a high absorption rate of many supplements (like Progesterone) can be achieved when delivered through the skin. (The physical size of the molecule plays an important role), Bioidentical natural progesterone is made up of small, fat-soluble molecules that easily cross the skins surface to be absorbed by the body and quickly circulate throughout the entire body. The result can mean as much as 90% of the supplement gets to the cells where they are needed. Which is why many doctors prefer trans-dermal delivery and say it is the delivery system of the future. Initially, in progesterone deficient women much of the progesterone cream is absorbed by the body, in time, levels reach saturation and continued progesterone cream doses result in increased blood levels of progesterone and a stronger physiological effect, resulting in less and less troublesome symptoms. Most women notice results right away, while for others it may take up to three months of progesterone cream usage. Since every woman's body is different, the time that you reach your maximum level of comfort may vary. For many women, natural bio-identical progesterone cream provides significant relief, with no reported adverse findings from usage by women for over 20 years. It is known that trans dermal application allows for easier absorption because with any oral medication or supplement the health and state of the colon can compromise its effectiveness. Natural bioidentical progesterone cream provides a safe, pleasant and efficient way to help your body help itself, the way nature designed the body to work. Many women going through intense estrogen dominance symptoms use it as a gentle and natural alternative to the synthetic hormones found in conventional hormone replacement therapy (HRT) drugs. Because this is bio-identical and not adverse to your body it can be bought without a physicians prescription. But don't let that fool you on its effectiveness, it is the most effective hormone balancing supplement you can take. For younger women, such imbalances are often associated with intense premenstrual syndrome, Fibroids, endometriosis or even PCOS and bring on symptoms such as, insomnia, irritability, breast tenderness, bloating, water retention, weight gain and pelvic pain. All of these symptoms have been associated with estrogen dominance-low progesterone levels. Studies indicate that bioidentical progesterone cream curbs estrogen dominance and hormonal imbalances associated with menopause and the absence or decline in progesterone. In 1999 trials at St. Luke's Hospital in Bethlehem, Pennsylvania, bio-identical progesterone creams reduced or eliminated hot flashes in 83 percent of the healthy postmenopausal women tested. Other clinical trials have shown significant weight loss, fibroid shrinkage, PMDD and endometriosis to be significantly improved by the use of bio-identical progesterone cream. Important Information: You should try to avoid xenohormones. If you do NOT avoid xenohormones and take natural progesterone, the progesterone will not be as effective. Long term chronic xenohormone exposure causes estrogen dominance. Women experiencing symptoms of estrogen dominance. Uterine Fibroids; It is known that women with fibroids have excess estrogen and are deficient in progesterone. Supplementing with bio-identical progesterone stops and reverses uterine fibroids. All women of any age who use progesterone cream should still take supplemental calcium (1000-1500 mg a day) to help prevent osteoporosis. Progesterone cream is not recommended when pregnant or breast feeding unless your health care provider specifically recommends it. Progensa 20 is an all natural bioidentical progesterone cream made from all natural plant derived ingredients. It is non-oily, does not leave a residue on the skin, and has extremely effective absorption qualities. Under normal usage, the 3 oz. container will last more than two months. 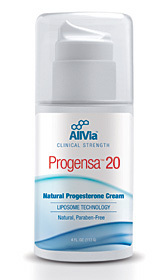 Progensa 20 progesterone cream contains all natural ingredients, including, grape seed extract (a natural preservative), aloe vera, vitamin E and primrose oil that enhance the performance of bio-identical progesterone cream when it is applied to the skin. The bioidentical progesterone cream is sealed in an airtight clinical hygienic container with a single pump dispensing dosage to protect the cream from losing its potency or from becoming contaminated from the microbes in the atmosphere. This unique airtight pump container protects the ingredients from oxidation and ensures potency of each dispensing dose of natural bioidentical progesterone being the same so you get consistent stable results. (Certified to United States Pharmacopeia/USP grade to contain 400 mg of USP-all natural bioidentical progesterone per ounce and 20 mg per dispensing dose/or 1 pump, this is the accepted standard dose. This 3 oz. containers holds 68 doses of all natural bioidentical progesterone cream which will last you more than two months. The accepted standard normal dose of bioidentical progesterone is 20mg per day. Official site for John Lee, M.D.